I don’t think you guys realize how darn small our Chicago apartment really is. Like picture a shoe box, then divide that by half, then divide that by half again for good measure…and boom you’ve got our home. I’m not going to lie, it’s been an adjustment living in super close quarters with my soon-to-be-hubby, but I must say we’ve been pretty great at the whole simplified living thing. Living in a 1.5 bedroom, 1.5 bathroom space forces us to stay organized and purge things we truly can live without (I feel like we have a never-ending pile for Goodwill). Living small is also forcing us to maximize every available inch of our space. That’s why we decided to add a mini “mudroom” to our office area. 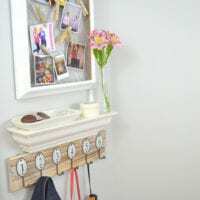 Bridget totally inspired me with her drop dead gorgeous entryway, and I decided that we needed to put our own twist on this hook and shelf setup. We do have a front closet (remember, the world’s worst closet? ), but it’s stuffed to the brim with our own coats and shoes. 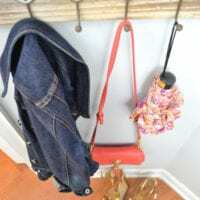 Whenever a guest comes over, there usually isn’t much room for their purse, jacket, keys, etc. So this new office drop zone area isn’t just for us, but it also serves as a fashionable & functional area for our guests’ goodies. It did take me a couple of weeks to gather everything for our mini mudroom, but then it took hardly any time at all to put it all together. Just some anchors, screws, and leveling to get these bad boys up and secure on the wall. We already owned the wire frame (a steal from a flea market), yet we hadn’t ever found a great spot for it in our Chicago pad. I think it works well above the shelf, as it provides some “art” and personality that can be changed up in no time at all. The shelf was actually a big score for me. I was on the lookout for a small shelf that was under 18 inches. I wanted it to be fairly sleek, and not jut out from the wall too much. My lucky stars aligned when I found this random little white shelf at Goodwill for $2.99. 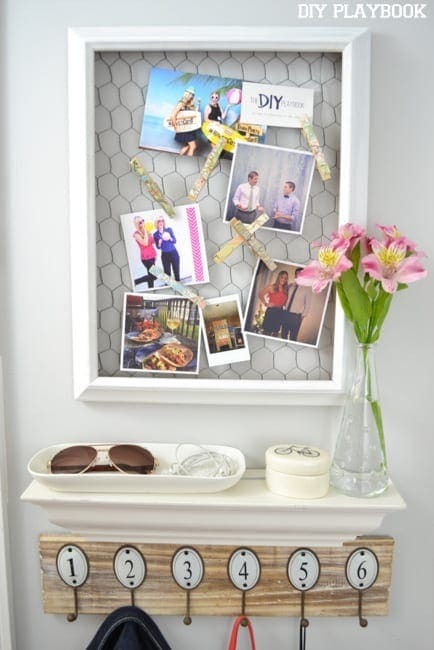 I had no idea if it would work with the space, but my worries disappeared the moment I brought it home and popped it onto the wall. It fit well over the hooks, and didn’t pop out of the wall too far. You just never know what you’ll find while thrifting! I love how the shelf is wide enough to hold a few small accessories (for decor purposes) and everyday items (for function). 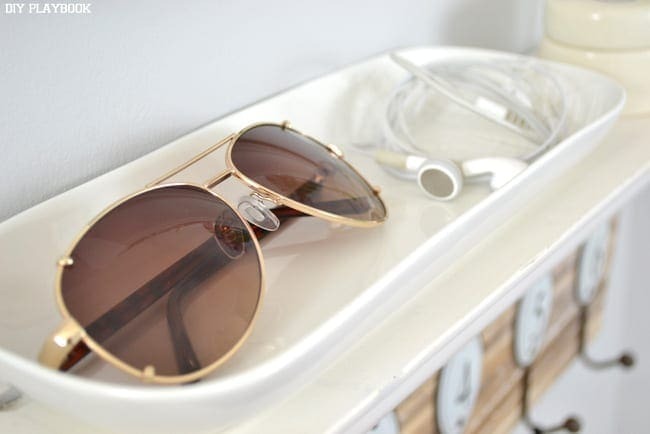 No more digging in my purse for my headphones or sunglasses…now they have their own place to call home right here at our drop zone. 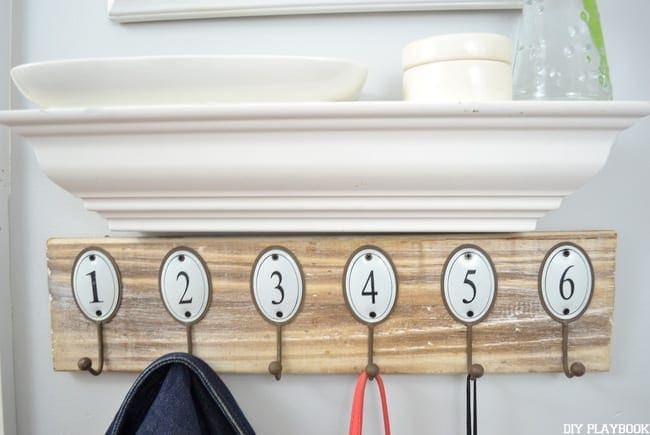 I love the quirky numbered hooks. 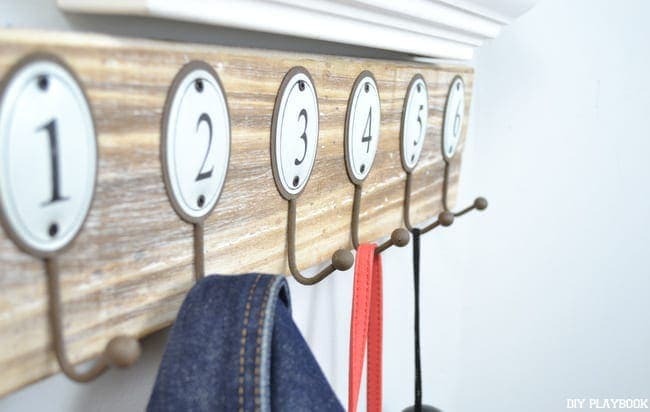 I found many cute hooks that could have worked well for the space, but I ultimately went with this one (found for $15 at HomeGoods) It’s a little rustic, a little quirky, and adds a little somethin’ somethin’ to the space. Not to mention it can hold a couple of jackets, umbrellas, scarves, and light bags. It’s not super heavy-duty, but I don’t think we’ll be hanging our parkas from these hooks. It feels nice to finally have these items up on the wall. Until I found all of the missing pieces of the drop zone puzzle, most of the items hung out in a pile on the ground. And a small pile of stuff…in a small apartment…feels like a huge pile of stuff. Poor Finn kept inquiring when I would hurry up and hang these things. Now that it’s finally all up, I just need to refrain from scaring away our first guests. 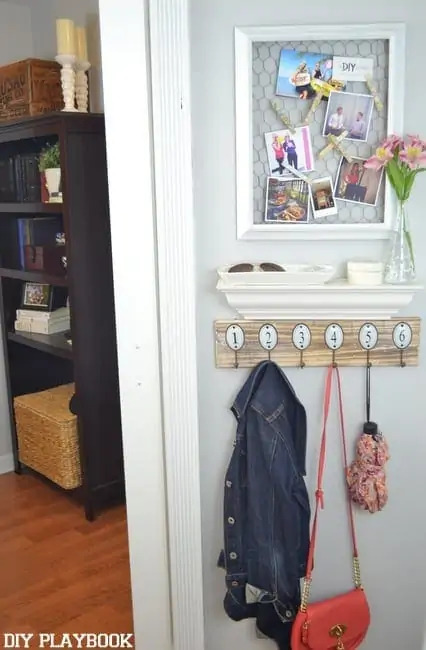 I’m sure I’ll usher them quickly over to our new “drop zone” to show them exactly where they can place their keys, jacket, and belongings. 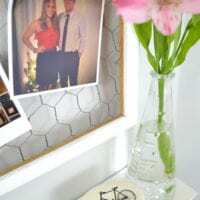 I suppose when you live in a little space, it truly is the little things that makes a huge difference in the function of your space. So we may have not DIY’ed amazing mudroom built-ins, but this simple upgrade will hopefully have a large impact on our day-to-day life.